Clients around the world turn to Grant Thornton for its asset recovery, digital forensics and forensic accounting services. 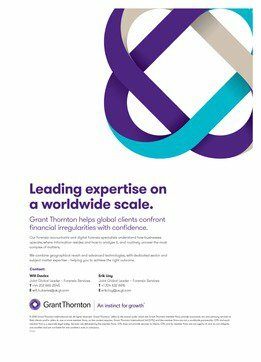 Having already established itself as a leading forensic accounting firm with stronghold practices in the US and the UK, Grant Thornton continues to expand its reach around the globe. It has established investigations practices in India, the Netherlands and Germany. Grant Thornton was founded in Chicago as Alexander Grant & Co in 1924, and by 1980 it had joined with 49 other accounting firms, including Thornton Baker in the UK. The firm maintains a major US presence with approximately 150 dedicated forensic professionals, most of whom are in New York, Chicago and Washington, DC. The US practice is led by global co-leader Erik Lioy who focuses on financial fraud investigations including corruption and kickback schemes, healthcare billing fraud, and construction and real estate fraud. Meanwhile, Paul Peterson returned to the US after a three-year stint in China, where he launched the firm’s China forensic practice. Grant Thornton UK launched its investigations practice in the 1980s. It’s now led by global co-leader Will Davies in London who is an experienced forensic accountant with a specialty in advising financial services and private equity funds. He is often retained by regulators in Europe and the Caribbean and has worked on many investigations into fraud and insider trading. Alongside Davies is Kevin Shergold, who heads the investigations practice and handles a range of matters including UK Bribery Act and FCPA investigations, and asset tracing. Kevin Hellard leads the insolvency offering in the UK and globally, and has been named as Asset Recovery Expert of the Year for 2018 by Who’s Who Legal. Vijay Rathour leads the digital forensic practice in the UK, which focuses on assisting clients with e-discovery and data analytics, and responding to cyberattacks and data breaches. Grant Thornton established its Ireland forensic practice in 2004. This has grown with the help of partner Paul Jacobs, who recently represented the Olympic Council of Ireland in response to an investigation into the illegal resale of Brazilian Olympics ticket allocated to the Irish sports body. Jacobs was formerly a director at EY, where he had worked since 1992. In the Netherlands, the firm began its investigations work in 2010 by acquiring a Dutch forensic boutique firm. The team has a mix of accountants, lawyers, former government officials and digital forensic specialists who have acted as court appointed expert witnesses. It has also undertaken bribery and corruption investigations in China, Poland, Moldova and Russia. In Canada, the practice is led by Jennifer Fiddian-Green, an anti-money laundering specialist who has handled more than 250 investigations across multiple industries. She previously served as a diplomat at the United Nations focusing on economic relations between the US and China. In 2000, the German firm Warth & Klein joined Grant Thornton to create Warth & Klein Grant Thornton. The firm expanded its investigations work to Germany in 2014, and focuses on the financial services, automotive, and manufacturing sectors. The firm has also built forensic practices across China, with a main office in Shanghai which houses a digital forensic laboratory for data to be processed and reviewed. Tim Klatte leads the forensic practice in China. Additionally, Grant Thornton was one of the first accountancy firms in India to start a forensics practice, and gained traction when Vidya Rajarao joined the office in 2014 from PricewaterhouseCoopers. Rajarao leads the practice in Bangalore, with over two decades of experience in forensic accounting in India and the US. Grant Thornton India has more than 70 forensic professionals, and has conducted investigations and asset tracing for the State Bank of India, IDBI Bank and Axis Bank. Grant Thornton is serving as the monitor for Barclays as the bank restructures itself to comply with UK ring-fencing legislation, which requires it to separate its retail arm from its investment banking activities. Grant Thornton has built up a global presence with over 50,000 employees in 135 countries – including 700 professionals in its forensic teams in 34 locations. While Grant Thornton declined to name any of its investigation-specific clients, general clients of the firm include Imperial Tobacco, Sky, the Cooperative Group, Airgas, Berkshire Hathaway, Hyatt Hotels and Nobel Energy. What’s more, the firm has conducted investigations alongside multiple major law firms including Baker McKenzie, Vinson & Elkins, Dechert, Norton Rose Fulbright, Herbert Smith Freehills, Eversheds Sutherland, Linklaters, K&L Gates and Travers Smith, among others. The firm handled some notable cases in the 1990s, including investigating the affairs of 12 syndicates following the Lloyd’s insurance market crisis. It also investigated the role of auditors in Singapore and London following the collapse of Barings Bank. Grant Thornton acted for national regulators across Asia during the Asian financial crisis of 1997. In the early 2000s, the firm helped the Serious Fraud Office (SFO) in its investigation into the United Nation’s Iraq Oil for Food programme. The SFO investigated British companies involved in the programme for possible sanctions breaches and corruption related to the humanitarian effort. The programme allowed Baghdad to sell oil in exchange for goods, but a UN inquiry claimed that Saddam Hussein’s government earned billions from the scheme. Grant Thornton acted for the Financial Services Authority, now the Financial Conduct Authority, in its investigation into the collapse of UK bank HBOS during the global financial crisis. Our forensic accountants and digital forensic specialists have experience of all types of financial irregularities. By combining sector and subject matter coverage from within our international network, Grant Thornton will deliver leading expertise to enhance global investigations. Our work ranges from targeted inquiries through to complex, international assignments. We undertake investigations of fact and the solutions we provide include data collection and preservation, data hosting and review, corporate intelligence, structured and unstructured data analytics, and remediation. We carry out assignments relating to fraud, asset dissipation, bribery and corruption, money laundering, cybercrime, competition law infringement, modern slavery, accounting and tax anomalies, regulatory breaches and wider misconduct. Our teams have undertaken significant assignments for leading multinationals subject to extra-territorial financial crime legislation. Grant Thornton International Limited member firms operate forensic teams in more than 30 countries. These are arranged into regional “centres of excellence”, thereby ensuring quality in the delivery of multi-jurisdictional investigations. This provides you with access to more than 600 dedicated forensic specialists around the world. With over 50,000 employees globally, we can draw on geographical and sector specialisms such as financial services, energy, extractives, life sciences, construction, manufacturing and retail. We combine rigorous investigation techniques with cutting-edge digital forensic tools, operating in agile, partner led teams. We understand where information resides and how to analyse it, ensuring that the most relevant facts are identified efficiently. We provide our clients and their stakeholders with independently prepared reports that are easy to understand. This allows our clients to make fact-based decisions in support of remediation strategies.